"Every Hour Wounds, The Last Kills"
The Marvels and Black Adam bury Osiris and Isis. Black Adam shrugs off Captain Marvel. Renee attempts to console him, and Black Adam reacts in fury, nearly killing her, but only letting her live in memory of his wife. In Bialya, the president speaks to Bruno Mannheim on the video phone with Death lurking in the background. Mannheim tells the president that Death is there to bring Black Adam down upon them, and that he's been double-crossed. 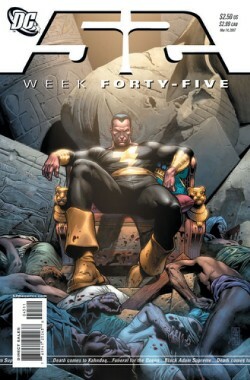 Black Adam bashes his way in, slaughters the president, and begins to decimate the army. At the Pentagon, Alan Scott and the government begin readying to deal with what Black Adam has wrought, killing millions in a sovereign nation. Atom Smasher demands a pardon in exchange for keeping silent about the Suicide Squad, and Waller relents. Black Adam cries, seeing memories of his family. Death arrives, emboldened by all that Adam has done. Adam takes him down and begins to torture him for information, making Death's death painful and slow. The Chinese superheroes prepare for battle. On Oolong Island, Silvana revels in the fact that Black Adam is on his way, as the other scientists cringe. Story - 5: It's kind of hard to screw up Black Adam decimating a country, ripping apart a sovereign nation as allegory/metaphor (perhaps? ), and turning completely from one polar opposite of character to the other with handy justification. The fight with death, the grief, the beats of the scenes all play well to form one of the final chapters of this so-far incredible series. Oolong Island now makes sense as a concept. Renee is embracing her arc's natural resolution. The heroes are rallying to fight Black Adam. The next few weeks are going to be insane, I'm sure. The only cog in the works is the cog that I've seen from the beginning. I'm unsure why, professed changed attitude aside, the world has allowed Black Adam to reign and continue in his tyranny. I mean, sure, no Superman to stop him, but then, if they're rallying to stop him now, I wonder why they didn't when he was ripping people in half in front of embassy ground. It almost negates the metaphor/allegory potential, in that if you're going to poke at the guy who invades and decimates the "sovereign nation" per Bush/Saddam (choose your freedom fighter/terrorist by your own opinion), you have to have the inevitable cry that occurs on either side (Bush, Saddam) for the man's departure from people with power before he does the absolutely unthinkable, particularly in a world with a bunch of folks who can juggle planets. Complex characters are not like that lady down the street who had fifteen kids with no money. "IT JUST HAPPENED! How was I supposed to know?" Especially characters who have complex backgrounds and histories. A relatively minor point, but one worth voicing. Art - 5: Despite two artists, every facet of this story is still vivid, consistent, and chugging along well. I have no idea how they're doing it, and why they can't do it in every DC book. From top to bottom, this series has been pretty darned uniformly great on the art department's side, and this is no exception. Cover Art - 5: Evocative of the story in question, brutal, dramatic, and, like most of the covers for this series, just about more than you could hope for. I cry again, where is this uniformity of awesome in the rest of the universe?